Human TNF-alpha, Tag Free, low endotoxin (TNA-H4211) is expressed from human 293 cells (HEK293). It contains AA Val 77 - Leu 233 (Accession # P01375). The protein has a calculated MW of 17.4 kDa. The protein migrates as 17 kDa and 18 kDa under reducing (R) condition (SDS-PAGE). 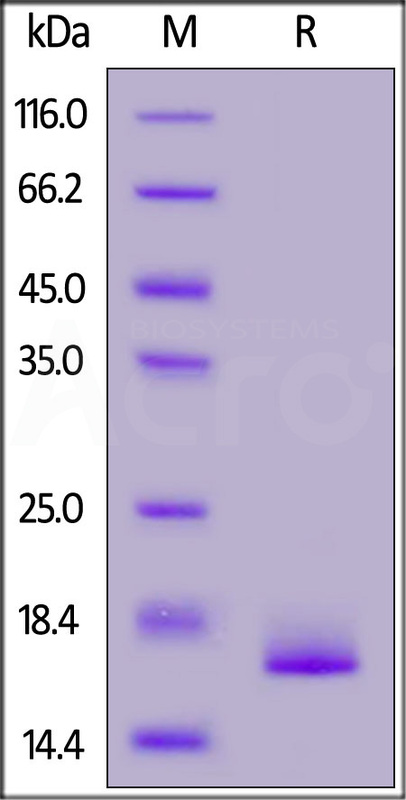 A SEC-HPLC analysis showing 95% of Human TNF-alpha, Tag Free (HPLC-verified), low endotoxin (TNA-H4211) present as active trimers with a molecular mass of 54 kDa. 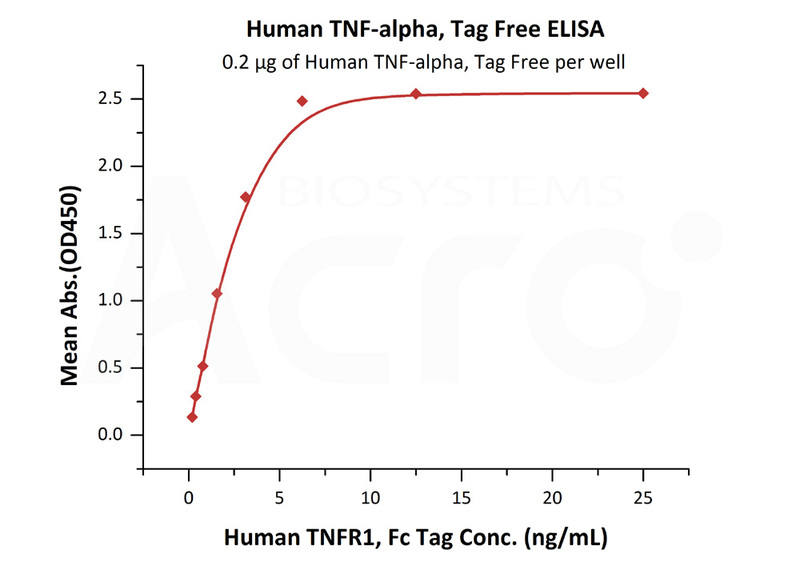 Human TNF-alpha, Tag Free, low endotoxin on SDS-PAGE under reducing (R) condition. The gel was stained overnight with Coomassie Blue. The purity of the protein is greater than 95%. 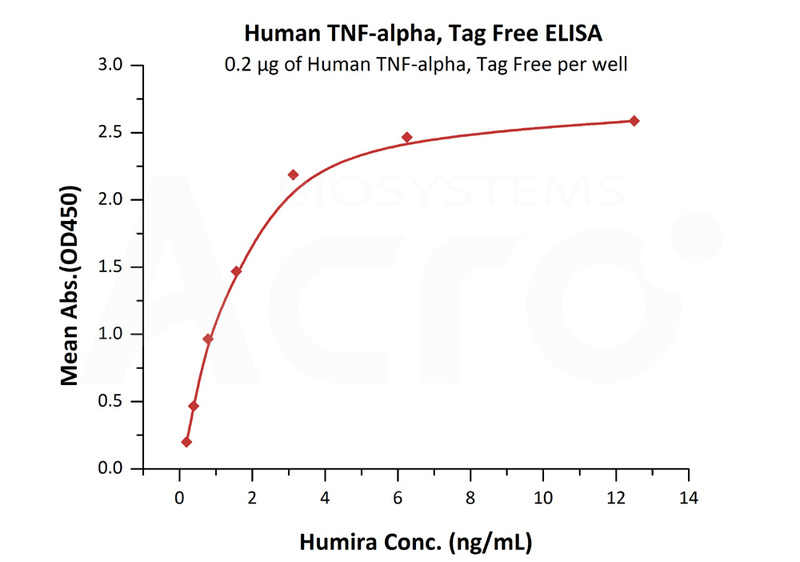 A SEC-HPLC analysis showing over 95% of Human TNF-alpha, Tag Free (HPLC-verified), low endotoxin (TNA-H4211) present as active trimers with a molecular mass of 54 kDa. Immobilized Human TNF-alpha, Tag Free (HPLC-verified), low endotoxin (Cat. No. TNA-H4211) at 2 μg/mL (100 μL/well) can bind Humira with a linear range of 0.2-2 ng/mL (QC tested). Immobilized Human TNF-alpha, Tag Free (HPLC-verified), low endotoxin (Cat. No. TNA-H4211) at 2 μg/mL (100 μL/well) can bind Human TNFR1, Fc Tag (Cat. No. TN1-H5251) with a linear range of 0.2-3 ng/mL (Routinely tested). Humira (Adalimumab) captured on CM5 chip via anti-human IgG Fc antibodies surface, can bind Human TNF-alpha, Tag Free (HPLC-verified), low endotoxin (Cat. No. 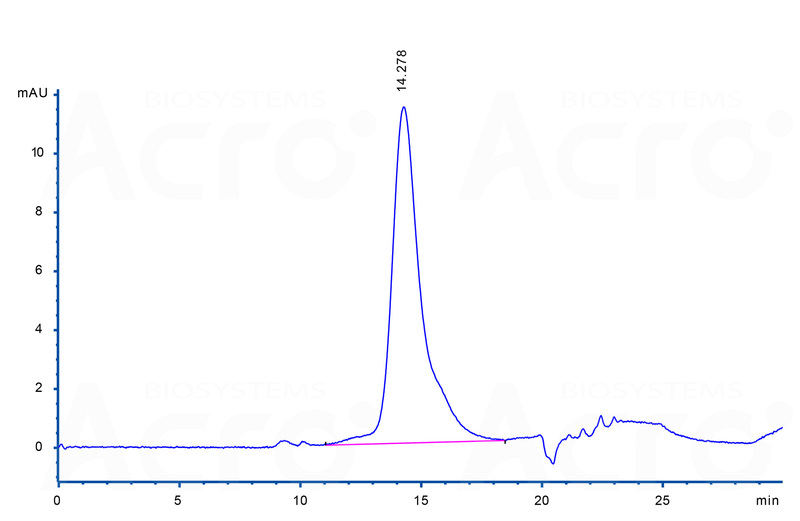 TNA-H4211) with an affinity constant of 0.255 nM as determined in a SPR assay (Biacore T200) (Routinely tested). Human TNF-alpha, Tag Free (HPLC-verified), low endotoxin (Cat. No. 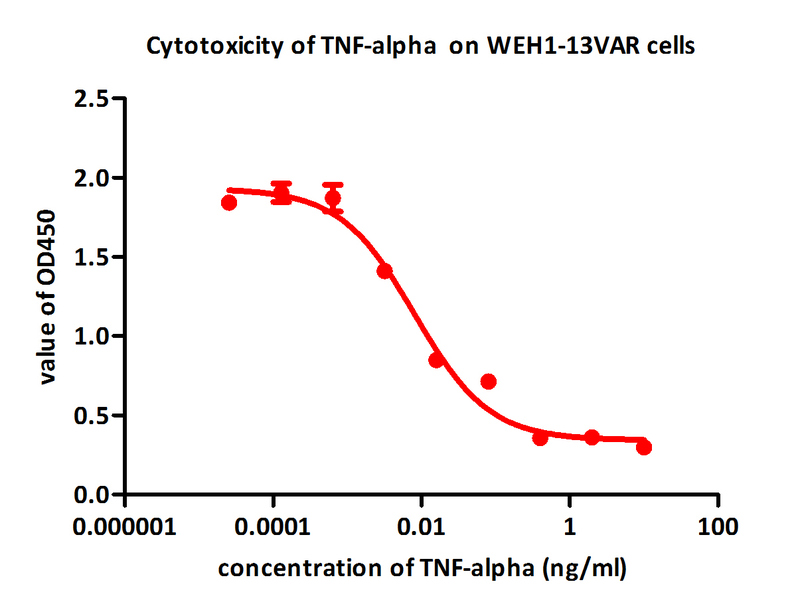 TNA-H4211) induces cytotoxicity effect on the WEH1-13VAR cells in the presence of the metabolic inhibitor actinomycin D. The EC50 for this effect is 0.007-0.014 ng/ml (Routinely tested). 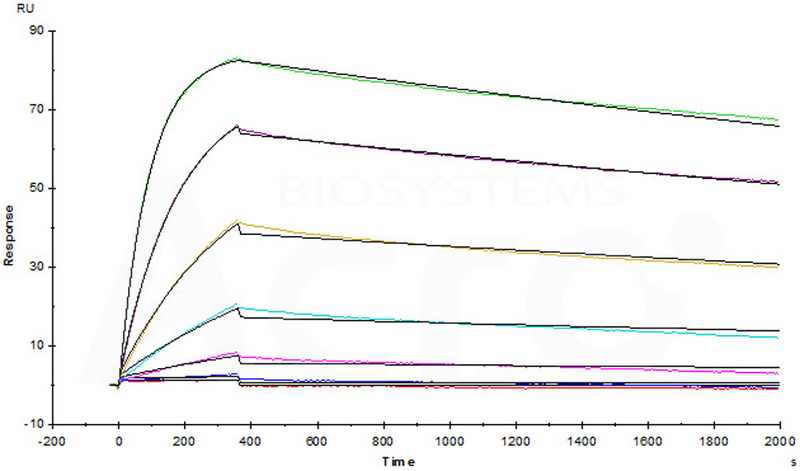 Neutralization assay shows that the cytotoxicity effect of Human TNF-alpha, Tag Free (HPLC-verified), low endotoxin (Cat. No. 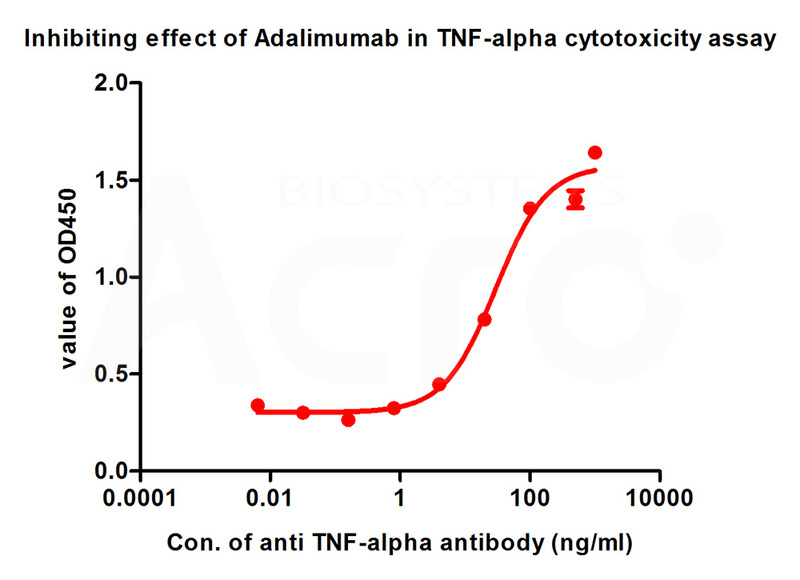 TNA-H4211) was inhibited by increasing concentration of Adalimumab. The concentration of TNF-alpha used is 1 ng/mL. The IC50 is 29 ng/mL (Routinely tested). Decrease of MiR-31 induced by TNF-α inhibitor activates SATB2/RUNX2 pathway and promotes osteogenic differentiation in ethanol-induced osteonecrosis. Authors: Yu L, et al.